By now, you likely know that a much-beloved priest of this Archdiocese and rector of our Basilica in Baltimore, Monsignor Arthur Valenzano, went home to the Lord earlier this month (see page A9). I was privileged to celebrate his funeral Mass and to hear the beautiful and stirring homily given by his best friend, Monsignor Thomas Tewes. The two had been close friends for decades and no one knew Monsignor Art better than Monsignor Tewes. His stories about Monsignor Art were so touching and insightful, it was like he was still with us and I didn’t want them to end. I suspect I was not alone in this regard. 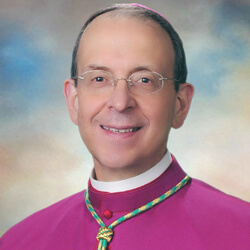 Monsignor Valenzano had a unique and enormous capacity for friendship. Not unlike St. John Paul II, he had the personality of a priest, which served as a bridge to everything and everyone. He was like a superhighway to Christ. He was always popular but never turned his popularity inward to himself. Instead, he used his extraordinary ability to connect with people for the Lord and for the church. I felt his friendship from day one, upon my arrival to the home we would share. Truth to tell, I felt like one of his brothers. In the morning, I was privileged to be the first one he greeted, and, if I was lucky, I was among those who could have a little drink and dinner with him in the evening. I, of course, was not alone in sharing this man’s friendship. To his family, brother priests, parishioners from every parish where he served, his golfing buddies, those who provided him with medical care, and special friends such as Bill McCarthy, this was a priest who loved us deeply and led us to Christ. He was the consummate man of prayer. When you live with someone you know whether or not they pray. Every morning, Monsignor Art would be on one end of the hall and I on the other reciting the Breviary. On his way to morning Mass at the basilica, he might comment on something he had read in the Breviary or he might tell me how the Orioles did the night before. When he took a walk, he’d quietly say the rosary; that included when he went up and down the upstairs hall using his walker. This summer, for a variety of reasons, I didn’t take vacation and I’m so glad I didn’t. I’ll never forget our conversations or his loving support. I wouldn’t trade the mornings I got to celebrate Mass with Monsignor Art – sometimes in the little chapel in our residence, sometimes in his sitting room or at his bedside. Just a few days before his death, I saw him celebrate his last Mass; he was bedridden, but wearing a stole he said the words of consecration with clarity and conviction. Art, of course, surprised us all the time. The day before he passed away, my spiritual director visited me and he wanted to go in to see Art. When we both went in I discovered that Art was the spiritual director of my spiritual director. That is the true pecking order! Monsignor Art loved being a priest and he loved the priesthood, not just in the abstract but in its everyday reality. He enjoyed life but lived simply and really had very few possessions. He loved to preach, celebrate Mass, hear confessions and grow the parish community. Art loved not only the priesthood but priests and we all feel the same about him. He was universally respected, always a voice of faith and reason. Even if and when he disagreed, he was never angry. How many people have told me in the past few days how deeply Monsignor Art touched their lives, something evidenced by the 35,000-plus people who visited the posts about his death on the basilica’s Facebook page. Those who took care of him at Johns Hopkins were touched by his faith and he helped many fellow patients when he was there as a patient in need of medical treatment. His suffering was not for naught. He told me he was offering his final illness for the evangelization of our archdiocese and for vocations to the priesthood and consecrated life. I’m sure this priest will continue to bear good fruit in our midst. His passage leaves a void which can only be filled by the love of Christ toward which we are opened by faith and hope.